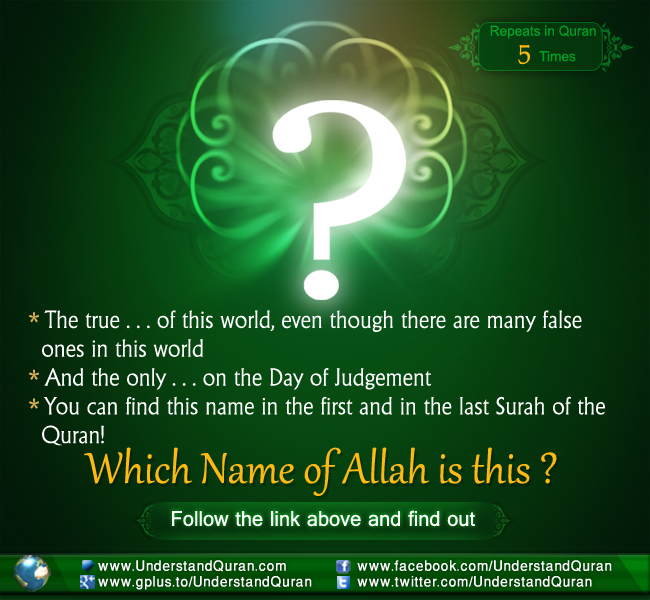 Understand Al-Qur'an Academy > 99 Names of Allah - Asma ul Husna > The Answer is—Al-Malik! 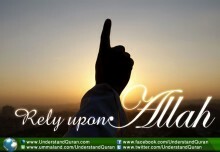 Allah calls Himself Al-Malik— The King and Owner of Dominion— on five occasions in the Quran. He is the King, the owner and ruler of the whole creation. Al-Malik gives authority to whomever He wants in this world, and He has supreme authority and is ruled by no one! Malik, Maalik and Maleek all come from the root maa-laa-kaa, which points to three main meanings. The first main meaning is to have possession and ownership. The second is to have power and ability and the third main meaning is to control and have authority. This root appears 206 times in the Quran in ten derived forms. Examples of these forms are malakat (“possess”), mulku (“dominion”) and al-malaa’ikatu (“the angels)”. Linguistically malik refers to the attribute of mulk; which points to power and ability: They do not possess ability. [Quran 13:16] Mulk also means possession and ownership: To Him belongs the Ownership of the heavens and earth [Quran 2:107] as well as control and authority: O my people, sovereignty is yours today, [your being] dominant in the land. But who would protect us from the punishment of Allah if it came to us? [Quran 40:29] Al-Malik is simultaneously the Ultimate King, Ruler, and Owner of all beings. 1. Stay within the limits of Al-Malik. Would you drive 60 mph while in a 30 mph zone when you know a camera is ready to record you and fine you accordingly? In your daily life keep reminding yourself to remain within the bounds set by Allah, al-Malik, your King, and imagine both His punishment and reward. 2. Don’t use the name Al-Malik. The Prophet salallahu ‘alayhi wa sallam also said: The most despicable name to Allah is a person who calls himself the king of kings, while there are no owners except Allah [Al-Bukharee, Muslim]. The name Al-Malik belongs to Allah ‘azza wa jall only. 3. Be patient and be a king in the Hereafter. The real sovereignty in this world for you is to strive for self-control. Don’t be a slave of money, fashion, or desire, but suppress your desires and constantly strive against the whims of your ego to please Al-Malik. As is beautifully quoted: Desire can turn kings into slaves and patience can turn slaves into kings! Recognize His ways of bestowing kingship: Say, O Allah, Possessor of sovereignty, You give kingdom to whom You will and take it away from whom You will. In Your hand is [all] good. Indeed, You are over all things competent! [Quran, 3:26] So be patient in times of hardship and in striving to stay away from what is forbidden by Al-Malik and He will give you an eternal kingdom in the Hereafter in-sha-Allah. Whenever you feel disheartened tell yourself Allah ‘azza wa jall is your Malik and you are part of His Kingdom. He does whatever He wants [Quran 36:82] and when something “bad” happens to you, know this is from His wisdom and that no matter how impossible your situation or ambitions seem, you can always ask Him only for a way out. Nothing is impossible for Al-Malik. All kings and owners, just or unjust, are low compared to Al-Malik. You are responsible for whatever you have authority over, and you will be accountable for it. In reality you don’t own anything; it all belongs to Al-Malik. So be just to your spouses, children, and even animals, and remind yourself that you will be dealt with by the King on the Day of Judgement. 6. Humble yourself in heart and body. Never be arrogant, and keep reminding yourself that you are an ‘abd (slave) of Al-Malik, no matter how rich or self-sufficient you might feel. Al-Malik reminds you of what your priority in your daily-life should be: Then High above all be Allah, the True King. [Quran 20:114] Be humble in your heart but also in your speech and appearance. Using foul language, speaking poorly of others, or having an arrogant body posture are not features of a believer who humbles himself or herself for Al-Malik— He sees you 24/7. The Prophet salallahu ‘alayhi wa sallam said, whoever says: la ilaha il Allahu waHadu, la shareeka lahu, lahul Mulk, wa lahul Hamdu, wa huwa ‘alaa kuli shayyin Qadeer -None has the right to be worshipped except Allah, alone, without partner, to Him belongs all sovereignty and praise, and He is over all things omnipotent- 100 times he will receive the reward of freeing ten slaves,one hundred hasanaat will be written for him and one hundred misdeeds will be washed away. He will be shielded from shaytan until the evening. No one will be able to present anything better than this except for someone who recited more than this. [Al-Bukharee, Muslim] The Prophet also used to say immediately following the witr prayer: Subhaan al-Malik al-Quddoos (Glory is to the King, the Holy) three times, and raising and extending his voice on the third time and then saying: Rabbil-malaa’ikati warroohi ( Lord of the angels and the spirit) [An-Nasaa’i]. O Allah, Al-Malik, we know that You are our only King and Owner. Help us in following Your commands and in being Your righteous slaves, and adorn us with patience and humility. Guide us in being just in all our daily affairs, and admit us to Your Kingdom of Paradise, ameen! PS: Did you already sign up to our newsletter? Sign up now and receive the free welcome gift to the Series The Names of Allah! Eko Triono November 25, 2012	Log in to reply. 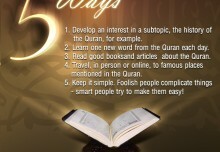 I LOVE YOU AL – QUR'AN. KAMULAH PENDAMPING HIDUPKU SELAMANYA. Abu Sulaiman November 26, 2012	Log in to reply. Another requirement of accepting Allah as Al-Malik is that we accept His law in all our spheres of our life. If we proclaim Allah to be our Malik and still disregard His laws in our personal and public life, in our social customs, finances, and our other areas, then it is not a sincere acceptance of Him as “Al-Malik”. May Allah help us accept Him as our “Al-Malik”. Liaquat Rabbani November 27, 2012	Log in to reply. A clear concept of the attributed name “Al-Malik” of Allah [swt] is the real strength of a person in life. He/She can accept all hardships without loosing hope and getting into despair. The belief that all happenings are due to His Will removes the ill-feeling that one may develop against person(s) that might have been instrumental to the situation. Saffiya October 4, 2015	Log in to reply. Khawlah bint Yahya October 6, 2015	Log in to reply. Ameen, and may Allah azza wa jall reward all those who are eager to study Islamic knowledge. HZ April 18, 2016	Log in to reply. Assalammualaikum. Thank you for this site. I would to ask a permission to refer this site for my assignment. wanda April 19, 2016	Log in to reply.